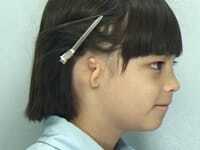 Microtia is an abnormally small external ear (auricle). It occurs in one out of every 8,000 to 10,000 births, either as an isolated condition or in association with other findings. 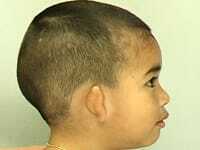 The causes of microtia are often not known for certain. It is thought to be a “non-inducible” type of congenital malformation, which means that it is not typically the result of the mother’s behavior during the prenatal period (such as the use of caffeine or alcohol). Microtia can occur in defined syndromes such as Treacher Collins Syndrome, hemifacial microsomia and other associated syndromes. There currently are no genetic tests available for isolated microtia. However, a geneticist will examine all infants for additional findings and discuss with each family the chances of having another infant with a birth defect. A prenatal ultrasound screening may assist families in early diagnosis, yet this test may miss some milder cases of microtia. Treatment may include plastic surgery for repair and reconstruction of any ear and/or facial malformations. Hearing loss should be evaluated and appropriately treated. Within the Division of Plastic and Maxillofacial Surgery, our surgeons routinely consult with ear, nose and throat specialists on such cases. In addition, children with microtia should be evaluated by ultrasound for potentially treatable renal or urinary tract anomalies. Cognitive delay is not typical for isolated microtia. Any child with isolated microtia who has a suspected developmental deficit can be assessed clinically and considered for cerebral imaging.